Jim Warren, retired pastor, died Saturday night February 10. • Noon – 2:00 p.m.
Funeral to follow at 2:00 p.m.
You’re invited to a FREE 90-minute live training event to learn how to better cooperate with God to advance His Kingdom through your church this Easter. Over 2,000 years ago, the very first Resurrection Sunday turned the world upside down and to this day—even in our post-Christian society—it holds a supernatural draw unlike any other day of the year. Will you be satisfied with a one-day attendance increase this Easter Sunday, April 1 and a return to the status quo; or will you go all out to cooperate with God for the sake of changed lives? Join coach, consultant, and trainer, Tommy Duke, for this 90-minute training event so your church will be in a better position to reach more first-time guests, re-connect with more of the people you haven’t seen in a while, and do a better job of retaining your Easter attendees long enough to make them disciples. With just a few short weeks between now and Easter, you don’t want to miss this time of check-up, encouragement, and lunch with fellow pastors (all provided by gifts of Alabama Baptists through the Cooperative Program). You’ll also hear about other opportunities to keep growing until and long after Easter. You, and the people you’ll reach on Easter, will be glad you cane. RSVP for FREE Now at plantalabama.org/easteradvance. Living the D-Life means living a lifestyle of discipleship. Think about it. What if you could successfully equip everyone in your ministry for a life of discipleship—anytime and anywhere? This is the purpose of D-Life. D-Life is not a program; it’s a lifestyle. It’s an organic, intentional, and simple process for equipping all believers for a life of making and multiplying disciples. D-Life is biblical, multi-generational, and reproducible. The Bible and the D-Life Web App or D-Life Journal are the only tools needed to equip leaders to lead and multiply D Groups of 3 to 8. The best way for a church or ministry to begin living the D-Life is to equip leaders in a D-Life Boot Camp. D-Life Boot Camps are designed to train believers to use the D-Life Web App or Journal for a life of discipleship. Ministries that equip their leaders through a boot camp are seeing great results. D-Life author and trainer, Dr. Bill Wilks, has led D-Life training in churches, ministries, and associations across the country. 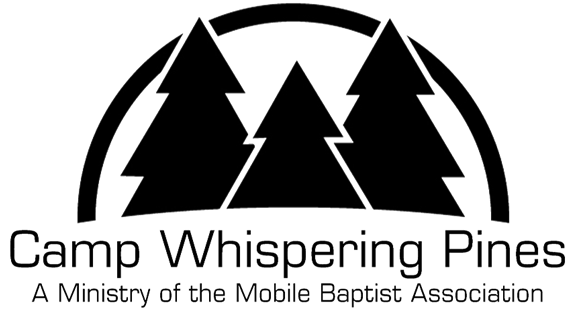 The Alabama Baptist, Life Bible Study, and several others are sponsoring two D-Life Boot Camp opportunities with Dr. Wilks for Alabama Baptists. For more information about D-Life or to register for a boot camp go to: livethedlife.com. How can ordained ministers save tax dollars? Ministers, financial secretaries, personnel, and finance committees will benefit from this conference. There is no charge to attend but please register so we will know how many to expect. For registration visitalsbom.org/event/ministers-tax-conference-mobile. Prayer is the start of missions. Through prayer, we gain a heart for missions and the capacity to reach the 72 nations that live in Mobile County. March 12, 2018, 11:30 a.m. at the International Ministries Center, will begin a one year season of prayer for the International Community living in Mobile County. Join us for a time of prayer and flag raising ceremony. Come enjoy roasted pork loin, rice, green beans, roll, tea, cake and banana pudding. Please make reservations for lunch and bring $5 p/person to help subsidize the cost. For a visual reminder, churches are also asked to consider purchasing two flags of the adopted nation. One flag is to be placed in a prominent place in the church building. The second flag will be hung at the International Ministries Center. Visit mobilebaptists.org/day-of-prayer-for-internationals for more information. For more information and to register visit lifeway.com/Abundance. The Center needs some important equipment. The biggest need is a color copier, followed by 2-3 classroom tables and sofas/chairs. 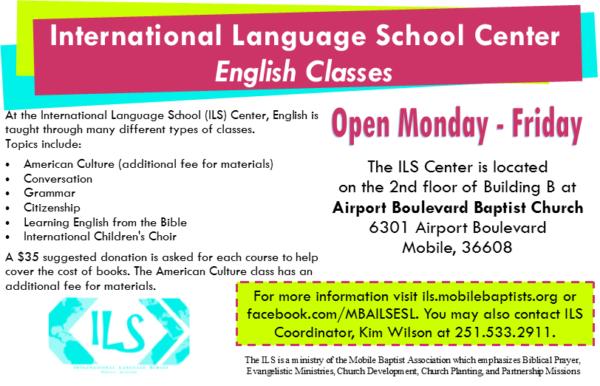 For more information and registration visit campwhisperingpines.com or call 251-866-7868.